In a medium-sized bowl, whisk together water, sugar, salt, egg and oil. Sprinkle yeast over liquid in bowl and let stand 5 mins. Stir in flour a little at a time, until you have a smooth but firm dough. Knead in the 1/2 cup flour. Let rise until double in bulk. Punch down, Divide dough into 2 pieces. Let rise 10 more mins. Place dough on 2 large GREASED pizza pans. Spread dough with fingers and pinch dough around the edges of the pan to make a lip. Spread with sauce to the edges. 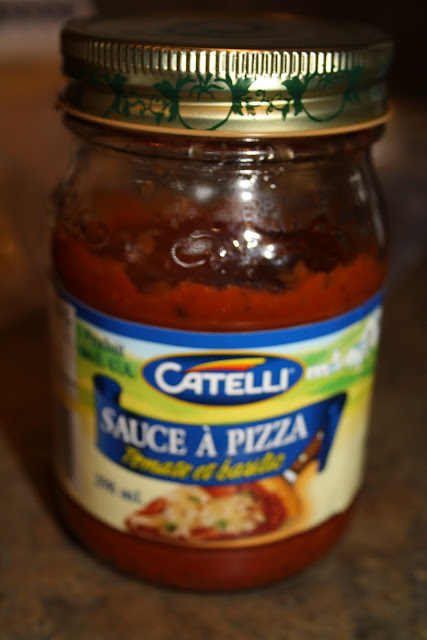 ( since the picture of the sauce is blurry and the label is in french(silly canadians!) it is Catelli tomato and basil sauce!) Sprinkle liberally with mozzarella cheese and toppings of your choice ( Mine was obviously meatless! But you can use this recipe to add WHATEVER toppings your hungry heart desires! )( My hungry heart desired tomatoes, spinach, onion, and pineapple!). Sprinkle a bit more cheese over toppings. Bake at 400degrees for 25-30mins. or until crust is golden brown on the bottom and cheese is melted and bubbly. It's SUPER yummy!! So try it and ENJOY it!! This sounds AMAZING!! I want it in my belly NOW, ha ha! So I just typed in a comment but apparently it disappeared? Haha. This looks so delicious! I"m all about meat but I can't pass up a delicious meal without meat! thanks for the shout-out, wasn't quite enough to get me over the hump, haha...and to think i was looking forward to you blogging about my episodes each week...although it looks like you've got plenty going on over her anyway...where do i start?